The Aussie Base Station is sure to transform previously docile adventures into super-strong, muscular, offroad expeditions. Aside from the sheer scale of the Aussie Base Station, it’s four telescoping jacks, one on each corner, that first catch the eye. These remote-control operated hydraulic legs are the key to its demountable truck portability. 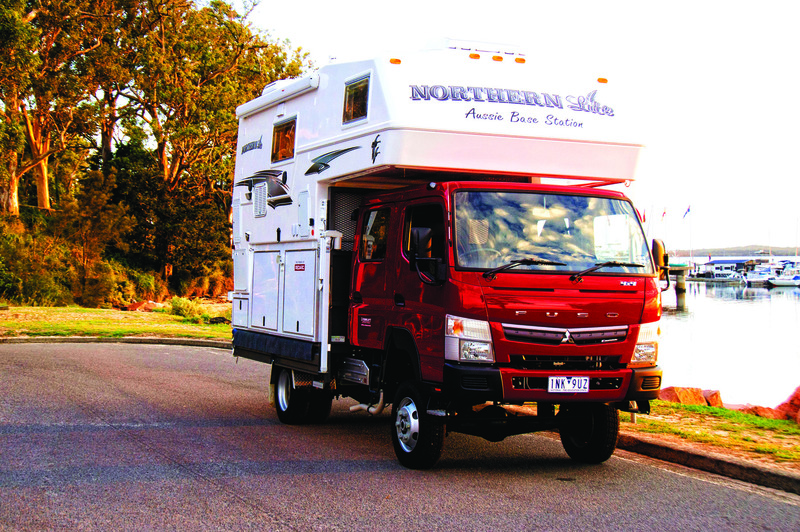 Northern Lite recommend a Mitsubishi Fuso Canter as the ideal truck on which to load the Aussie Base Station (ABS). To attach truck and camper, the ABS is positioned onto the back tray of the Fuso simply by reversing the truck back between the gap left when the hydraulic jacks are fully raised, with each — as you’d assume even without an instruction manual — resting on an even surface. The lifted ABS is centred over a basement docking station already secured to the tray of the Fuso. Once the Fuso is in position, the legs are then lowered carefully until the camper comes to rest, snugly, on its basement. A CAMPER WITH A BASEMENT? Yeah, this threw me too; a basement — what the? Rather than a subterranean grotto where you store wine, tools or piles of old Camper magazines, The ABS’s basement is a sort of docking platform to which the bulk of the ABS itself, the living quarters, is affixed onto the tray of the truck. Again, Northern Lite have set up a production routine that can efficiently marry the ABS to the tray of a Fuso Canter, ideally, or if you prefer, to an Isuzu NPS. But if you have another light truck you favour instead, Robyn, Garry and the team at Northern Lite will be able to accommodate. Northern Lite can develop your basement in two ways. The more traditional of the two is to attach it to the camper. In this instance, the camper, with attached basement, is raised on its jacks, the Fuso reversed into position and the camper lowered into place. The remarkable legs — heavy-duty, wireless remote-operated HappiJac jacks — make loading and unloading a simple five minute task. 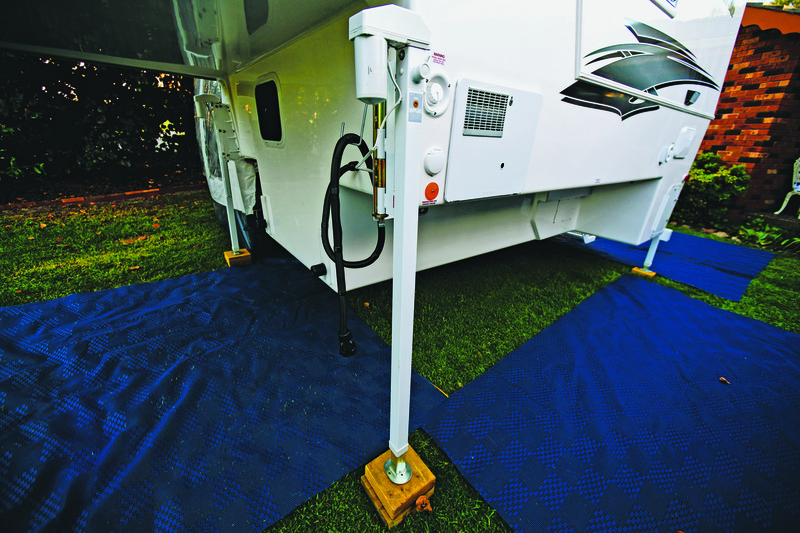 Simply press a button to raise, then, when ready, lower all four camper jacks as one. Alternatively, you can adjust each jack individually, should the need arise. The unit is then fixed to the tray with six bolts, with a quarter-inch sheet of rubber, acting like a giant gasket between the two, securing a comfortable docking connection. 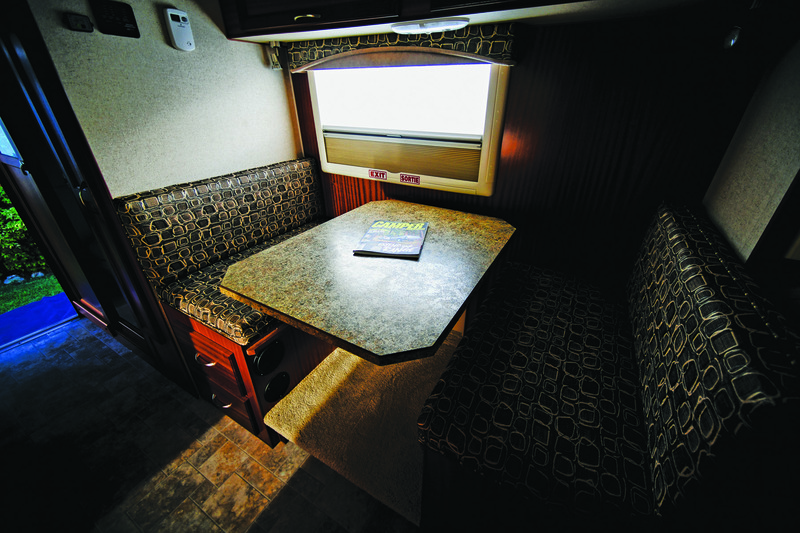 Or, if you prefer, Northern Lite can go the other way, instead fixing a basement to the truck’s tray. If this is the preference, then it’s more or less the same; except you reverse the tray, with a basement secured to it instead, into the space between the raised jacks supporting a basement-free camper. 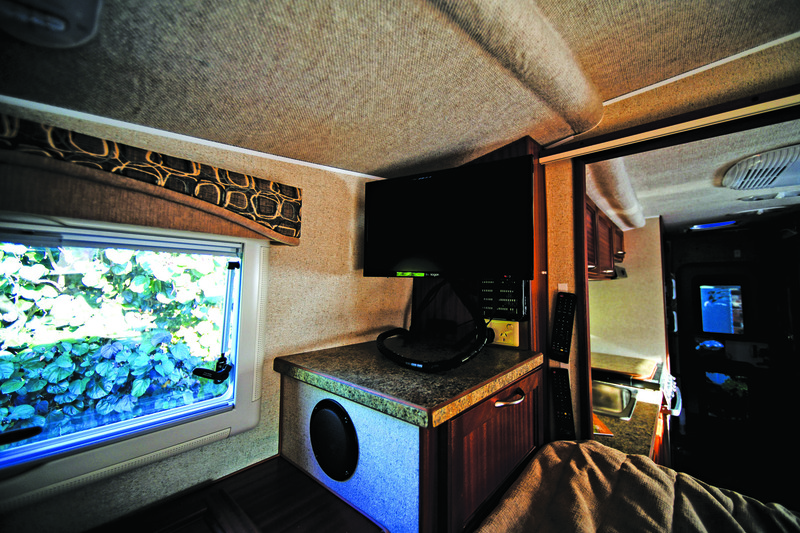 Similarly, a quarter-inch sheet of rubber acts as a smooth connecting interface between the two surfaces, basement and camper. It’s an opportunity for true bespoke customisation and continuous after-sales service, naturally on offer from Northern Lite, that quickly took hold and resonated with me during the three days I spent with Robyn and Garry. They stay in contact with all their customers, and more than that, know where pretty much all of them are, at any given time. Garry is, quite literally, just a phone call away. Garry told me he gets calls, out of the blue, from people he sold a camper to more than ten years previous. But what sets Garry apart from just about anyone else confronted with a random phone call from a customer last seen ten years ago, is: he listens. He listens, nods his head, asks questions, tries to understand the problem and then, if a solution isn’t immediately at hand... listen to this…he organises to rendezvous with the stricken customer with his toolbox! Garry – to use an often misused phrase – is a genuine one-off. The after-sales service on offer after buying a Northern Lite is second to none. 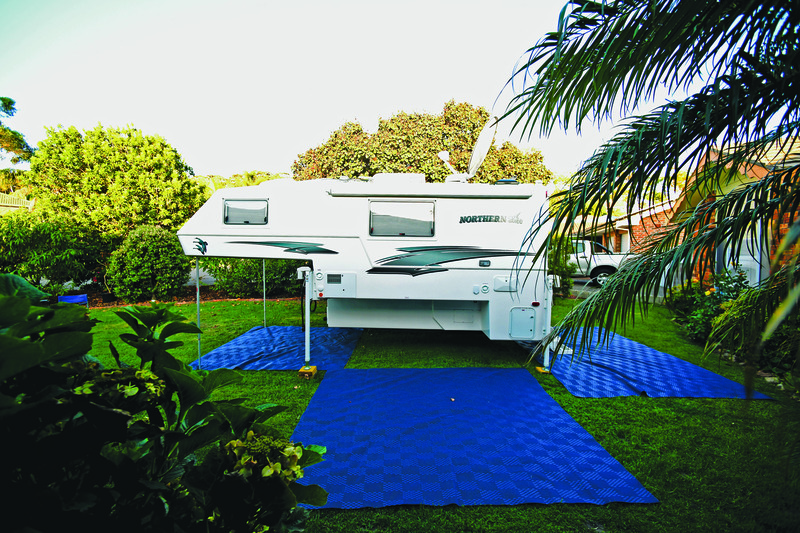 When you purchase an ABS you get a level of after-sales service more or less unknown in any industry, let alone the camper trailer industry. If there were awards for this sort of thing, Robyn and Garry would win every year. In fact, even secondhand purchasers of an ABS, people Garry and Robyn have never previously dealt with, are bestowed identical service if ever in woe. Robyn and Garry are not only proud of their product, they’re also concerned — no not concerned...genuinely interested in — its ongoing mechanical health. 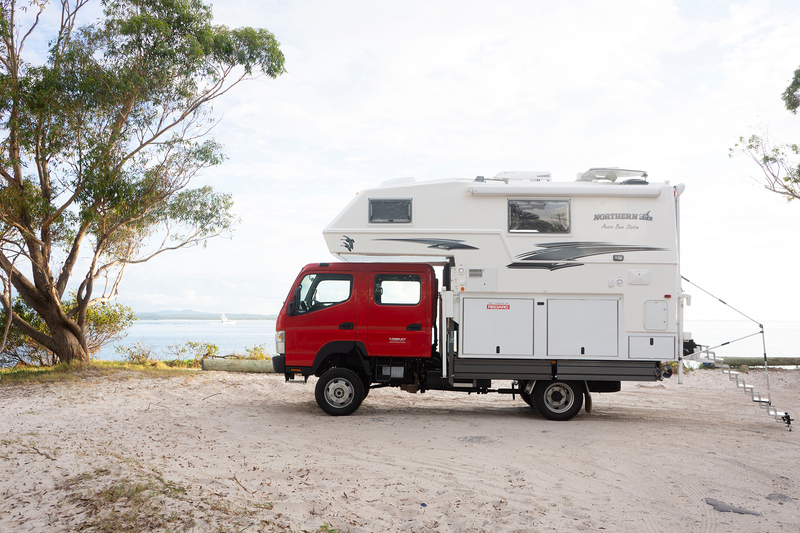 As your ABS spends many years wending its way around Australia, compounding adventure upon adventure, Robyn and Garry will want to know how it’s going – regardless of whether you bought it secondhand. They will actually expect regular updates from the road. The basement, when you have a good look at it, is really just a massive series of storage lockers designed around the shape of the camper’s bottom. 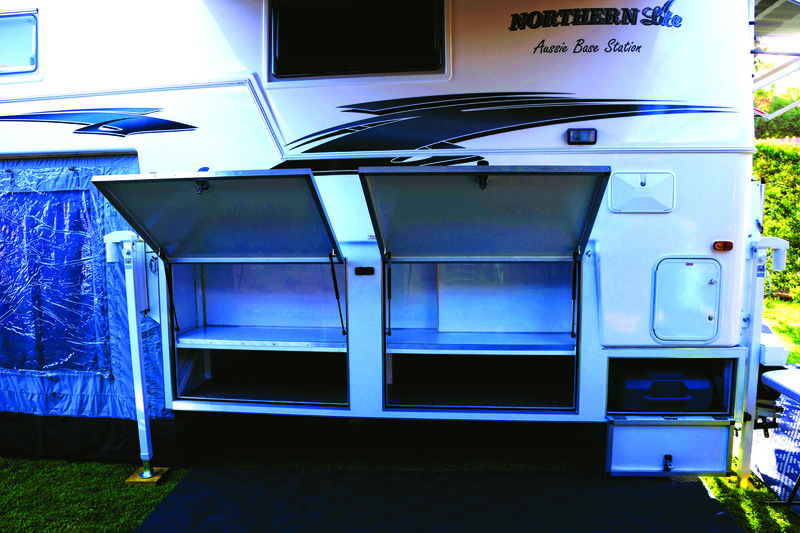 Aside from providing the structural foundation, Northern Lite will custom-build any configuration of storage system you desire. Want lots of small shallow lockers? No worries. Want lots of large deep lockers? Again, no worries. The common factor in all configurations is volume. The available volume capacity in the basement storage unit is immense. Now that the truck-tray docking with camper relationship is, hopefully, understood, it’s time to talk about what’s in the ABS. First up, on the roof: an Outback TV satellite dish that, if you want, folds down upon engine ignition. Automatic folding down capability is probably a good thing. If you’re absolutely gagging to watch the news or catch up on a huge sporting match, I can, I suppose, understand the attraction. But yeah. It’s a TV. Have you watched Australian commercial TV lately? You’d be better served repeatedly slapping yourself across the face with a rolled up clump of bacon rashers. If you’re into TV, the dish will delight you. As well as its roof-mounted satellite dish, the ABS is bristling with other top spec features. Offgrid energy management-wise, the ABS comes with a REDARC BMS, a Redvision monitor, Cotek 2500 watt sine wave inverter and a full complement — 300 amp hours in fact — of lithium batteries. Inside, the ABS is reminiscent of a North American log cabin. Every piece of cabinet joinery is finished in rustic timber. Up front there’s a queen bed with mattress aerator and topper with a Heki skylight above. Standing up and walking back towards the door; to the left there’s a kitchen bench, three-burner cooktop with glass cover and sink; to the right, a U-shaped dinette. Down further, to the left, after the kitchen, there’s a 180L fridge freezer; to the right, an ensuite with commode and shower recess. Above everything on the ceiling as you continue down the central aisle: a Houghton Belaire reverse-cycle air conditioner. Heading down towards the back door from inside the ABS, there’s a sense of walking down an aircraft’s central aisle, but rather than emerging onto a cement apron, you instead alight a set of sturdy folding steps into an ever changing wilderness scene of your choosing. Without anyone waving orange batons around, either. There’s an electronic remote control awning over the back steps, as well as two huge ones, right and left, on either side. 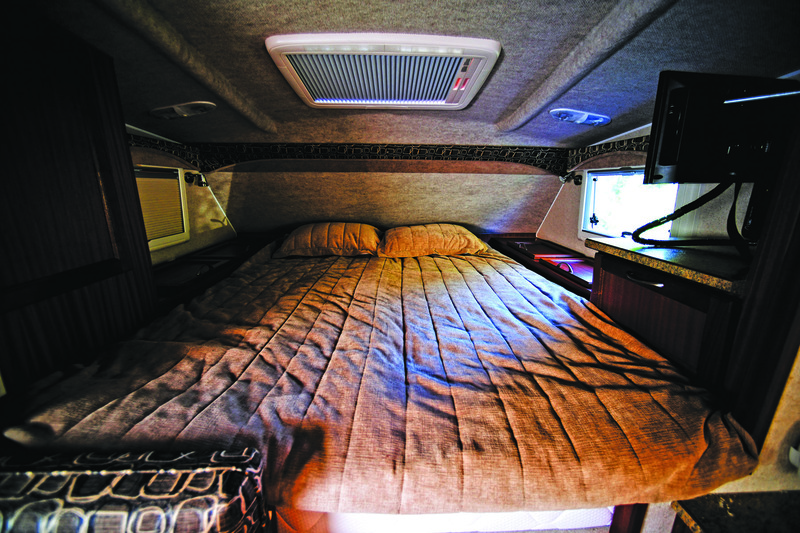 Once the ABS is detached from the truck tray, the front nose underneath the queen bed section provides ample space for another canvas-enclosed annexe. People sometimes use this as a large kids bedroom, some even use it as a study. While Camper was busy testing, a client and devotee of Northern Lite from WA, at the factory to oversee the finishing touches to his order, said he intended on using his ABS as a base from which to conduct his mobile business. As he plies the long, thousands of kilometres of western coast roads, the front annexe, he said, would be the perfect position for his mobile office. The ABS is big. The truck it attaches to is big. The commitment to buy one is big. 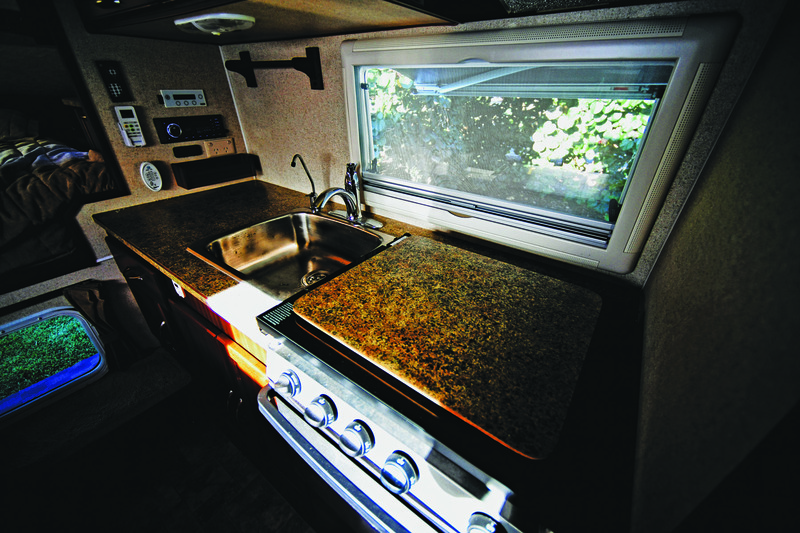 But if the need is there, and it’s a slide-on style camper you covet, a truck-mounted slide-on style camper is something you should consider. It takes towing out of the equation completely. Speaking with the ABS client from WA, he says he’s found that nothing else comes close in terms of its offroadability, and indeed its base driveability, over the unrelenting, changeable offroad conditions he encounters during his days plying the west coast roads from Margaret River up to Kununurra. 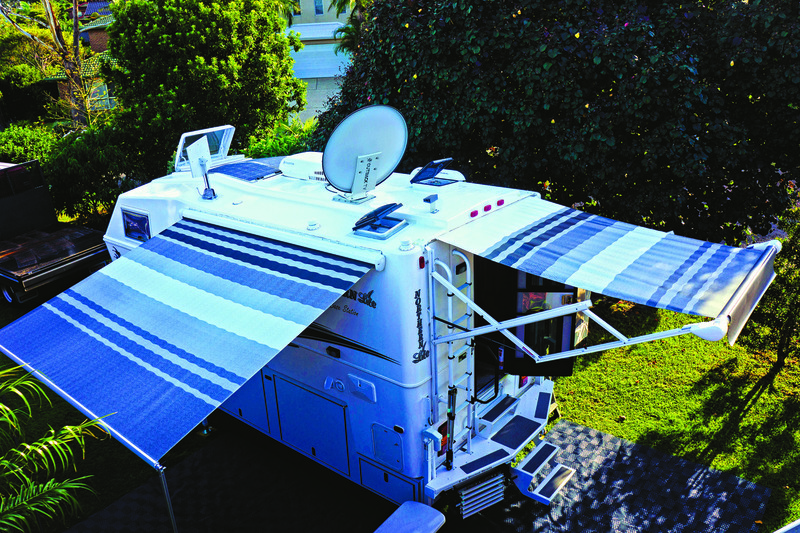 As well as the Aussie Base Station’s capability, it’s also — much more so than your average camper — a comfortable home if you intend to spend months on the road. The list of features is a long one. It is truly designed for serious expeditions into the remote wilderness — without having to sacrifice the comforts of home. In short, if it’s what you’re after, it’ll immediately hit the bullseye.